This is our flagship, foundational meditation program. The innovative, science-based iNET process (exhaustive binaural beats, isochronic tones, biofield entrainment, and more) embedded within the Profound Meditation Program interacts with your brainwaves and biofield to immerse you in deep states of meditation. The complete program includes Primary Meditation Tiers 1-3, Releasing Meditation, Gamma & HyperGamma Meditation, and Epsilon Meditation (6 CDs/19 download tracks/430 total minutes). Increase your energy & flow: Getting into the "zone" will come more easily, you will have more vigor for both work and play, and your other practices (sports, yoga, weight training) will be more engaging and powerful. Enjoy effortless focus: Put an end to the feeling of constant distraction. Instead, cultivate laser-like focus in your projects and deep presence in your life. Recover quickly from stress: Fortify your brainwave and biofield patterns to respond with greater confidence and ease to whatever life throws at you. Discover how easy it is to meditate: You don't need to be a Himalayan monk or recite secret mantras to experience the profound benefits of meditation. Simply put on your headphones, press play, sit quietly, breathe, and listen. Experience deep and more restful sleep: Do you often wake up groggy and miserable? Are you tired of being tired all the time? See what a difference it makes in your sleep quality when your brain learns how to truly and deeply relax on a regular basis. The level of entrainment has been been the most gentle and powerful I have ever experienced. I have experienced deeper states of meditation with a sense of profound centering, calming and true meaningful spiritual communion. The entire PMP 3.0 system contains more than enough power to allow for my evolution for years to come." ~ Alexander Leuthold, Dipl. Psych. The science behind Profound Meditation draws on the work of numerous consciousness researchers, from Dr. Jeffrey Thompson to Rupert Sheldrake to Dr. Jacobo Grinberg-Zylberbaum, and many more, including the emerging work of iAwake Co-Founder Eric Thompson. One important scientist, C. Maxwell Cade, was a pioneer in the development of biofeedback and is well known in meditation circles for discovering the “Awakened Mind” brainwave pattern. However, it is less well recognized that he discovered another, more advanced pattern he referred to as the “Evolved Mind” pattern. Using the Mind Mirror (a unique EEG machine he developed) Cade saw an exceptional balance of high-amplitude Beta, Alpha, Theta, and Delta activity in the brains of highly seasoned meditators and spiritual aspirants. This "Evolved Mind" pattern appeared during subjective reports of unconditional joy, bliss, and expansive awareness, suggesting that it could act as a bridge, integrating the conscious mind with the subconscious and unconscious minds, as well as the collective unconscious, in a unified flow. The biofield signals in our Primary, Releasing and Epsilon meditation tracks contain this Evolved Mind brainwave pattern. As such, not only will you experience the target brainwave patterns facilitated by the auditory entrainment signals in these tracks, but you will also enjoy a full spectrum of precisely tuned biofield entrainment signals, resulting in a more powerful and well-rounded overall experience. There are going to be some weeks when, like it or not, you’re not going to be able to put in more than 20 minutes a day. Well, on those days, you can adjust your brain entrainment routine and jump right to the third tier, making as much of your 20 minutes as you like. With the PMP 3.0 technology, you have something that is powerful enough and flexible enough to change as dynamically as your meditation practice does from week to week, and it can grow with you exactly as you need it to. The Primary Meditation tracks are designed to provide a lasting foundation for your transformative daily meditation practice. Scalable to 20-minute sessions, these tracks employ a fully integrated multi-faceted approach to brainwave and biofield entrainment, including: Comprehensive Binaural Encoding, Dual-Pulse Binaural Signals, Harmonic Layering, Rhythmic Panning, Temporal Entrainment, and Energetic (Biofield) Entrainment. Mix and match tracks for the level of stimulation needed and desired on any given day. In other words, this is not a linear system in which you progress from “level 1” to “level 2” to “level 3” and so on. Rather, the entire program packs enough “evolutionary push” to last for many years, letting you scale and adjust your usage as you grow and flow in your practice. In our 24/7, always-on, “go go go” culture, it’s important to remember that our natural biological rhythm is more of an “ebb and flow.” Great athletes know that the “recovery phase” is just as important as the “training phase”—and the same holds for meditation. Releasing Meditation provides your brain and body the time they need to integrate and rest between periods of more intensive meditation. This decreases the “overwhelm” associated with other entrainment programs and “hyper-masculine” approaches to spiritual development in general. Additionally, the Releasing tracks evoke the brainwave patterns scientifically correlated with deep emotional release—including the powerful “Effortless EFT” (Emotional Freedom Technique) method. Use these tracks whenever you feel a sense of “rawness” or “edginess” beginning to creep into your meditation experience, or when you feel the need to process emotional issues and energies that arise as you deepen your consciousness. There is deep, and then there is deep. Though the brainwave patterns on the Primary Meditation Tracks go as low as 0.3 Hz—which is truly deep enough for advanced spiritual growth—some of us really would like to go as deep as possible in meditation. For those of you who share this aspiration, the Epsilon Program takes you there. The frequencies on these tracks range from 0.1 Hz to 0.001 Hz. As far as we know, these are the deepest brainwave frequencies available anywhere. Why would you want to take your meditation practice to the very limits? Maybe just because you can. But also, there is evidence to suggest that these ultra-low frequency brainwave patterns can act as carriers for some of the ultra-fast frequencies found in highly advanced meditators and associated with extraordinary experiences and insights. The Epsilon tracks are thus one of the most experimental and cutting-edge aspects of the overall Profound Meditation Program. The feedback so far from early adopters has been phenomenal, and we invite to join us in the adventure. Extraordinary focus. Accelerated information processing. Expansive compassion. These are some of the qualities that have been associated with high-amplitude Gamma brainwave activity (40-99 Hz) in advanced meditators while practicing Tibetan Buddhist Loving-Kindness Meditation. Consciousness researcher Dr. Jeffrey Thompson found activity even faster than this, which he referred to as Hyper-Gamma (100 – 199 Hz) and correlated this state with extraordinary states of consciousness and spiritual development. The Gamma & Hyper-Gamma Program is designed to stimulate these ultra-activated brainwave states. 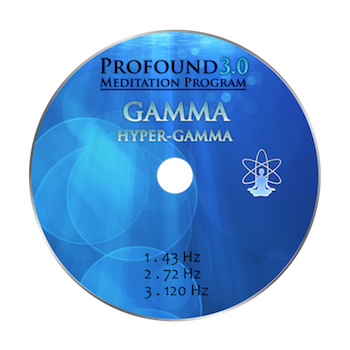 By substituting the Gamma & Hyper-Gamma Program for your Primary Meditation sessions every 3rd or 4th day, for example, you’ll not only add refreshing new energy to your weekly practice, but also create a truly full-spectrum spiritual practice that includes all of the major brainwave patterns: Hyper-Gamma, Gamma, Beta, Alpha, Theta, Delta, and Epsilon. The bonus Digital Euphoria Special Edition session is a set of precise frequencies associated with the brainwave patterns and energetic signatures of euphoria, endorphins, serotonin and Chi—with effects similar to the famed “runner’s high.” This Special Edition version differs from the original in that it was originally specially commissioned by Integral Life, and developed as one continuous track. Note: Only available as a digital download for all Profound Meditation 3.0 "Full Spectrum" and "Core" Program purchase options. The Profound Meditation Program comes with a 32-page user guide to help you get started quickly and get the most out of the program over time. The guide includes: quick start instructions • core meditation instructions • a rich section on emotional releasing techniques • sample “mix & match” strategies for combining tracks effectively • technical support on creating personal playlists • links to additional resources, and more. NOTE: The Profound Meditation Program 3.0 does not contain guided meditations. Instead, it contains nature soundtracks integrated with cutting-edge neurotechnology and biofield energy medicine to precision-tune your brain, nervous system, and subtle energetic system to deep, transformative states of meditation. As the name suggests, these meditation tracks will make up the main part of your daily meditation practice. The three 20-min meditation tracks on CD 1 contain carrier frequencies that are less powerful than those found on CDs 2 and 3. The three 20-min meditation tracks on CD 2 contain carrier frequencies that are more powerful than those found on CD 1, but less powerful than those found on CD 3. The three 20-min meditation tracks on CD 3 contain carrier frequencies that are more powerful than those found on CDs 1 and 2. The biofield entrainment amplitude on CD 1 is less powerful than those found on CDs 2 and 3. The biofield entrainment amplitude on CD 2 is more powerful than those found on CD 1, but less powerful than that found on CD 3. The biofield entrainment amplitude on CD 3 is more powerful than those found on CDs 1 and 2. I am not easily given to praise, in a world where there seem to be so many answers and cures and remedies. So many people claim to have the perfect solution to our problema. But I have to say, I have found both the use of PMP 2.0 and 3.0 to be genuinely transformational. I don't say this lightly. The best way to describe it is that I now have a groomer, cleaner, personal trainer, secretary, accountant, mentor, coach, etc. all visibly acting around the periphery as well as the nooks and crannies of my life, all gently making contributions to improve the overall. This to me represents real change, as it should be an evolution rather than a revolution. PMP 3 is an evolutionary LEAP forward, a testament to your obvious dedication to provide one of the best tools for the assisted development of "a complete human being" that so many of us aspire to. You're turning dreams into capacity and potential to reality." ~ Martin J. Schoen, Psy.D. If you are not completely impressed with Profound Meditation Program 3.0, let us know within the first 90 days, and we’ll gladly give you a full refund.